DSNet Manager JAVA based software puts you in control. Software allows access to each receiver to configure system, image quality, power on/off receivers, and turn video or audio off. Supports resolutions up to 1600x1200 at 100m / 300ft distance. Ability to go up to a total maximum 300m / 900ft when daisy chaining a maximum of five DSRXL receivers. Easily scalable system allows up to 80 displays to be connected using the DS Series eight port transmitter and DSRXL receivers. 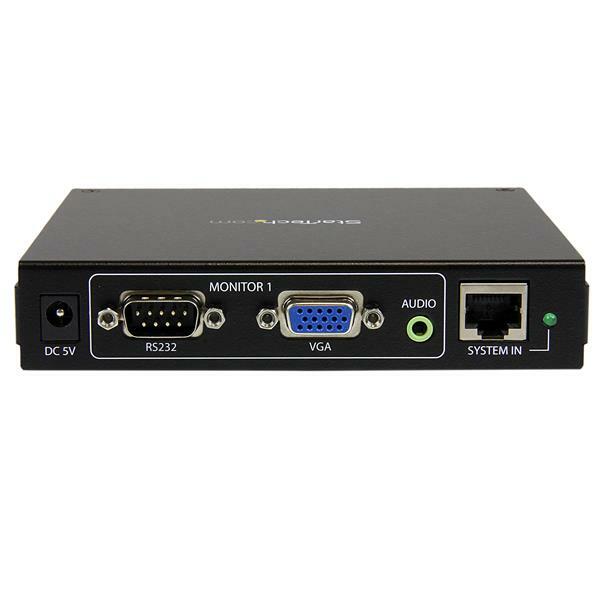 StarTech.com's DS Series Digital Signage Broadcaster VGA Cat5 Receiver offers a comprehensive audio and video extension system, with the added benefit of serial control! 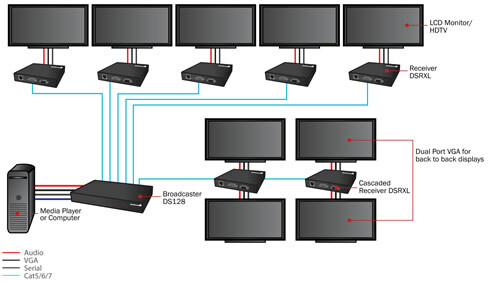 The DSRXL VGA Receiver(s) can be installed at the destination points, allowing you to distribute VGA video as well as the accompanying audio and serial control signals from the connected Serial, Audio and VGA Cat5 Digital Signage Broadcaster (DS128 - purchased separately), all over one Cat5 cable. Use digital signage to catch the attention of your audience and deliver up to date content the way you want it to be seen and heard. The DS Series can be used in education, health care, retail, hospitality, and other environments. Broadcast up to 80 displays when daisy chaining receivers. 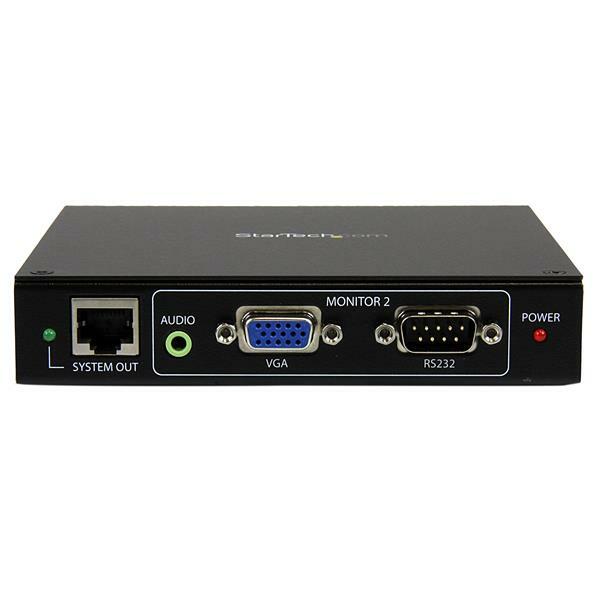 Deliver a VGA, audio and serial signal to each display along with the DSRXL receivers. 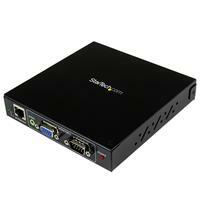 With RS-232 controls you can control displays from the PC or media player. 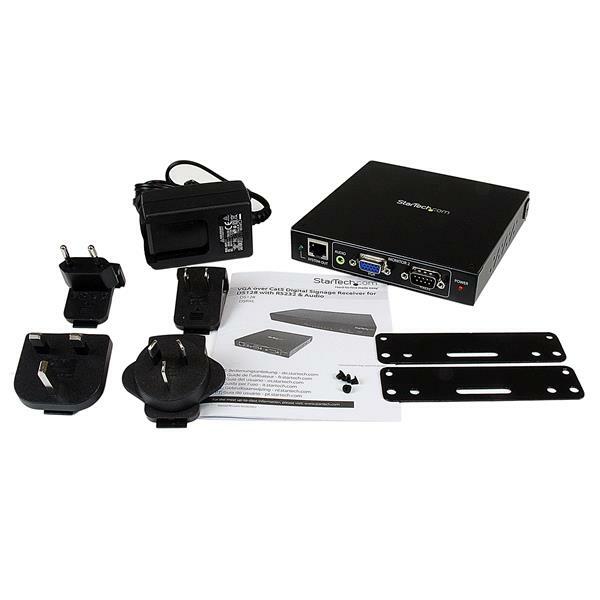 One system, one Cat5 cable to deliver and control your video, audio, and serial signals to each display. High resolution support of 1600x1200 ensures high quality signal delivery for high definition content. Included DSNet Manager software saves time allowing to tweak each receiver and display anywhere on a local area network or a wireless local area network. Future additions are easy with the ability to split each receiver to two displays or daisy chain up to five receivers.